Recordings of Yiddish speech now available on Internet sites showcase the reinvention of Jewish culture in modern times. Beginning with Sholem Aleichem’s comedy monologue recorded in 1915 and ending with a feminist Yiddish podcast, this “playlisticle” offers a glance at some of the best examples of live recorded voices of Yiddish literature and culture, both secular and religious, popular and highbrow, Old Country and especially New available on the internet today. It tracks the changes in Yiddish language in America over the course of a century, as evidenced by these now easily available recordings. Listen to “Ven ikh bin Roytshild”, read by Sholem Aleichem himself. “Ven ikh bin Roytshild” is at the farthest possible remove from “Cohen on the Telephone.” The speaker in Sholem Aleichem’s signature monologue is your typically broke Jewish breadwinner, whom he captures at the most precarious moment of the week. Classes are over, the boys have been sent home and there’s not a kopeck in the kitty for his wife to prepare for the Sabbath. The monologue captures our hapless breadwinner in that liminal moment between the weekday and the Sabbath, when the discrepancy between dream and reality is in sharpest relief. The only way for our pater familias to problem solve is rhetorically, through his lifelong habit of Biblical interpretation and Talmudic analysis. What is a teacher of sacred texts if not someone who dreams in singsong? In no time, we enter into the Sabbath of his mind—all the more precious here in America, where almost everyone is forced to work on the Sabbath. The speaker’s first item of business is to get his wife off his back, a tortuous hermeneutic process that is perfectly captured by the rise and fall of his voice. So, in addition to the familiar plot-line of trying to make ends meet for the Sabbath, what immediately situates the monologue within the epicenter of Yiddishkeit is the intonation. 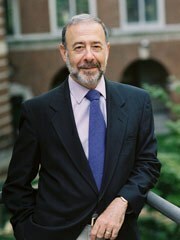 The melamed is talking Talmud; he uses the discourse of men and boys studying the Talmud out loud. Bringing the monologue home are the music and natural rhythm of the Ukrainian Yiddish dialect. If we listen carefully, we can also pick up the palatalized consonants, as in the words keshenye, kn’eln. Even at 75 cents, a king’s ransom in 1915, this 10-inch 78rpm demo disc is a huge bargain. Since the founding of the famed Vilna Troupe, the exemplar of the Yiddish Art Theater movement, Noah Nachbush was the go-to actor to play The Messenger in An-ski’s Dybbuk. 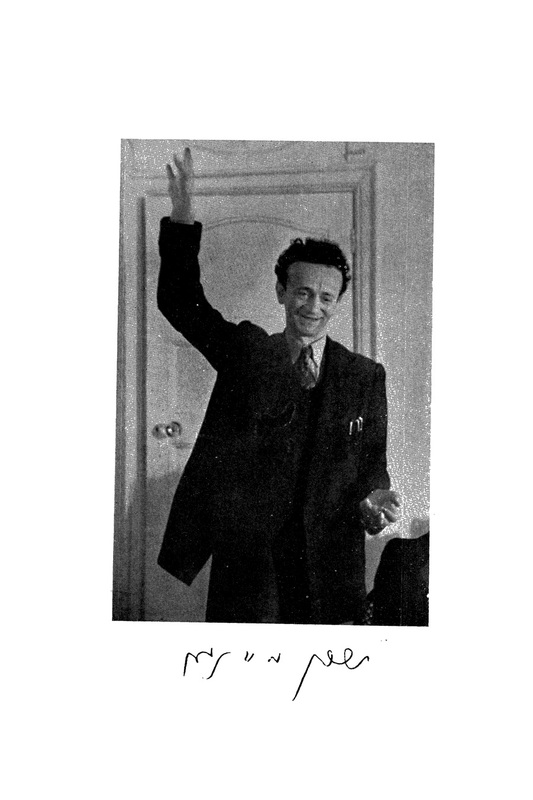 As a stand-alone artist, it stands to reason that Nachbush learned to perform “Ven ikh bin Roytshild,” which he issued as a separate disc in 1952, making sure to advertise his version as aranzhirt, i.e., “adapted and rendered.” This gave him license to abbreviate the text and to expand its theatricality. Nachbush is obviously playing for laughs—he actually begins the monologue with the melamed laughing at his own joke—and significantly exaggerates the rise-and-fall of his intonation. This last changes both the character of the melamed and the nature of the performance, making the melamed comically, overtly, exaggeratedly Jewish-sounding and effeminate. By exceeding the expressive range of your average henpecked husband, something that Sholem Aleichem’s performance was careful not to do, Nachbush turns the melamed’s monologue into a set-piece designed to foreground the actor, not the character. Hertz Grosbard was in a class by himself. 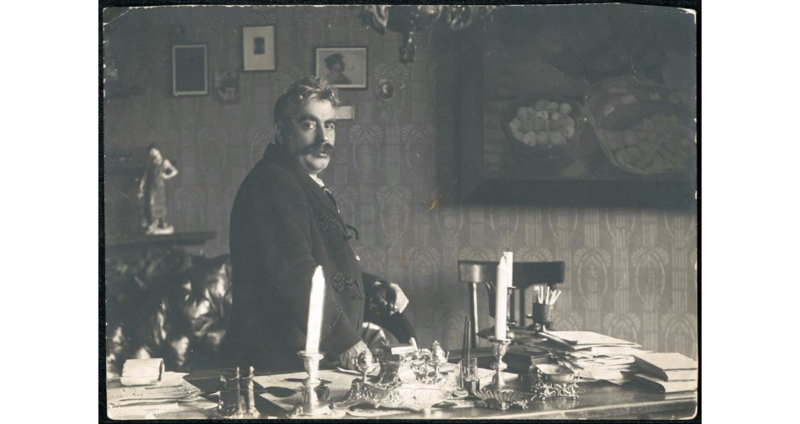 Although he too started out on the German and Yiddish stage, Grosbard dedicated his life to the stage craft of the vortkontsert, the solo reading. He performed on a bare stage, seated at a small table, with a reading lamp and no microphone. His cultural project was to create a highbrow recitational art that placed the newest written-as-spoken voices in modern Yiddish literature center stage: Eliezer Shteynbarg, Itzik Manger, A. Lutzky, and Moyshe Nadir. Only after winning over his secular, urbane audience with the best that contemporary Yiddish culture had to offer did Grosbard circle back to the classical repertoire of Peretz and Sholem Aleichem. Grosbard is the first reciter on record to place a premium on enunciation and elocution. With its deliberated rhythm, even “Ven ikh bin Roytshild” has a writerly feel to it. Here, as elsewhere in Grosbard’s performance, there is no attempt made to preserve any specific Yiddish dialect. 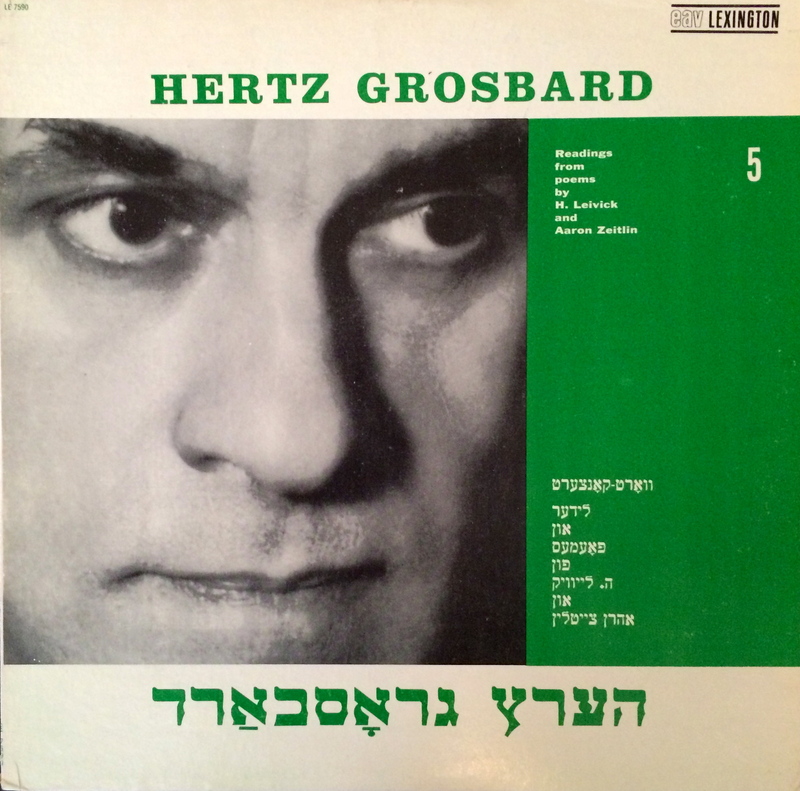 Listen to Hertz Grosbard performing “Ven ikh bin roytshild”. The most obvious difference in Grosbard’s delivery is that he slows things down. For Grosbard, the source of Sholem Aleichem’s humor is not so much the melamed’s affect as his mental gymnastics. What’s funny is the mock-analytic mode of his thinking, how the melamed zeroes in on each economic shortfall and then proceeds to conjure it away. Thus, for example, Grosbard stops at “oder neyn, in the second place I would take my Sabbath gabardine out of pawn—or better still, my wife’s squirrel-skin coat.” Grosbard’s slower delivery signifies something else, in addition. It’s his way of separating high comedy from low. Grosbard suggests through his pacing that Sholem Aleichem deserves our absolute attention to every turn of phrase and rhetorical flourish. Yiddish has a classical repertoire that demands recitational excellence. The death of Mani Leyb in 1953 at the age of seventy was an awful awakening to the critic Abraham Tabachnik. Was it possible, he asked himself, that Mani Leyb’s voice had been erased forever? If this could happen to a founder of Di Yunge, the so-called Young Guard of American Yiddish poets, then there was no time to lose. So Tabachnik bought himself a reel-to-reel tape recorder and initiated a project that he called “The Voice of the Yiddish Poet.” Seeing as the reel-to-reel tape recorder was a portable and capacious medium, Tabachnik conducted in-depth interviews with some twenty-odd poets, so that future generations would be able to hear them both recite the poems of their own choosing and hear a complete, unfiltered interview with the poet, background noises and all. Tabachnik’s interviews are now available through the Yiddish Book Center’s Frances Brandt Online Yiddish Audio Library and through Merhav, the online archive of the National Library of Israel. Who would fail to be seduced by Manger’s voice and flamboyant, devil-may-care persona? By the time he appeared in Tłomackie 13, he had already achieved the perfect fusion of natural delivery, epic simplicity, and individuated lyricism. Only Manger could endow a ballad about a little boy wanting to become a bird with a rhythm, diction and dialogue so accessible that it seemed to have derived from the folk itself. Never mind that the troubadour was now on his last legs and was reciting from a book. The next generation of Yiddish poets whom Tabachnik embraced were the Introspectivists, for whom free rhythm became the hallmark of poetic truth. If two poems shared the same rhythm, proclaimed the In zikh manifesto, then one of them was lying. A woman might be admitted to their ranks, if in addition to free verse, she also brought free love and open eroticism to the table. Thus was born Celia Dropkin’s persona as the “Circus Lady” (also translated as “The Acrobat”), courting death, embracing failure, in “an intimate, experiential, embodied poetry more radically personal, edgier and more unbridled” than even her male colleagues had attempted. 4 4 Edward Hirsch, “Fully Loaded: The Poetry of Celia Dropkin,” JQR Review 93 (Spring 2017). http://www.vqronline.org/essays-articles/2014/04/fully-loaded-poetry-celia-dropkin. Yet however bold her imagery on the printed page, however much her “repetitions evoke a trance-like feeling,” they are nothing when compared to the sound of her voice. Listen to Aaron Glantz-Leyeles read his poem, “Der got fun yisroel” (begins at 5:55). No less authoritative and natural was the voice of Avrom Sutzkever, who by 1943 had become the poet laureate of the Vilna ghetto, and like Leyeles—the Yiddish poet whom he most admired—Sutzkever began writing verse that was meant to be heard and not only read. In the Vilna ghetto, moreover, where Yiddish was the lingua franca, lectures and recitals were the main venue of cultural discourse. Here is Sutzkever reciting his ballad of the plundered shoes, in which he transmutes the murder of his mother into a bizarre, supernatural encounter of the living with the dead. 8 8 For an English translation of “A vogn shikh” see, A. Sutzkever: Selected Poetry and Prose, trans. Benjamin Harshav and Barbara Harshav (Berkeley: University of California Press, 1991), 151-2. Available online: https://publishing.cdlib.org/ucpressebooks/view?do… Even without knowing when and where the poem was written, Sutzkever’s declamatory style, so heavily indebted to the Russian tradition, transports the listener back to another time and place. Listen to Avrom Sutzkever read his poem, “A vogn shikh”. Hertz Grosbard, whose work also appears earlier in this list, was a performance artist of the Yiddish word. To compensate for the self-imposed limitation of performing solo, Grosbard built his repertoire on dramatic situations, whether it was Eliezer Shteynbarg’s fabulous talking animals and inanimate objects tempting, cajoling, and debating one another; the lovesick Galician Yiddish folk bard Velvl Zbarzher writing letters to his beloved in distant Constantinople; or the deeply contemplative Hasidic master, Reb Nahman of Braslav sharing his joie-de-vivre with a trusted scribe. Grosbard trained his audience to really listen: To listen for tag-lines, parody, code switching, and language treason. He sharpened their aesthetic sensibilities by giving special prominence to rhymes, aphorisms, and puns. He helped them reimagine a universal Yiddish-speaking polity by underscoring differences of gender, age, social position, world-view, and species (whether human or animal, wind instrument or percussion). And he partnered with poets who thought as he did. “Jazz” was one of several “improvisations” by the American-Yiddish poet, A. Lutzky, which he would perform to great acclaim at solo readings. Lutzky never returned to Europe after immigrating in 1914, other than to fight alongside American forces in the battle of Verdun, so it was left to Grosbard and other Yiddish actors to take his show on the road; and since Luztky died before Tabachnik got hold of him, Grosbard’s performance is the only recording we have. No performance was complete without it, as I myself, who attended Grosbard’s readings on more than one occasion, can personally attest, performances as fast and flawless as the one you are about to hear. “Jazz” is all rhyme and syncopated rhythm, a madcap mixture of sense and sound, Old World and New (“from Kol Nidre to Aida”), instruments and animals, idiom and neologism (Ale viln malegern. / Ale toyte viln vern. // A tsebrazg fun ale tsaytn. A tsebroyz fun ale vaytn; “Everyone wants a second run. The dead all want to live again. [Hear] the furious sound of all the ages. The seething of all the reaches.”). 9 9 To our knowledge, this poem has not been translated into English. Listeners are advised that the poem includes the n-word. In live performance, Grosbard collapsed all spatial boundaries. His audience could be sitting in the Jewish Community Center in Czernowitz and be transported to Greenwich Village. In recorded performance, Grosbard collapses all temporal boundaries. Suddenly, the contemporary listener is transported back to a time when Yiddish culture was at the cutting edge, seizing on the new with no holds barred. Listen to Hertz Grosbard perform “Jazz” (begins at 4:00). It wasn’t only by means of jazz that the new Yiddish sound could be disseminated. In America, as of September 6, 1923, it was also through the frequencies of ethnic radio stations. Yiddish radio was minority discourse because, as Ari Y. Kelman explains in Station Identification: A Cultural History of Yiddish Radio in the United States, Jews had to learn to listen to the English radio before Yiddish went on the air and also because even in the best of times, it was essentially a periodic activity—only on Sundays could one hear Yiddish all day long, by switching from one station to another. Its discourse, moreover, was essentially bilingual even when the program was all in Yiddish. The Yiddish modernist poet Mikhl Licht, for example, as I learned in the course of my interviews with his widow, supplemented his meager income writing ad copy for the Yiddish daily Der tog by translating the latest hit songs into Yiddish for Molly Picon to perform on the radio. Yiddish radio was either Jewish entertainment, with commercial sponsorship, or Jewish enlightenment, with institutional sponsorship. Listen to NPR’s special on Yiddish radio commercials. Besides Yiddish advertising jingles, like this one for Shapiro’s kosher wine (begins at 2:50), the radio gave rise to new forms of ethnic performance: to Victor Packer’s Amateur Shtunde; to Nahum Stutchkov’s Jewish family dramas, and to the grammayster, Zvi Skooler, who revived the performance style and greatly expanded the repertoire of the badkhn, the traditional Jewish rap artist (the subject of a brilliant study by Beatrice Lang). 10 10 Beatrice Lang Caplan, “Tsvi skuler der grammayster” YIVO-Bleter: Naye Serye, Band IV. Yidishe Folklor/ Yivo Bleter: New Series, Volume IV. Yiddish Folklore. (2003): 193-234. Radio became the urban voice of Yiddish in the here-and-now, the scrappy, infinitely adaptable voice of a very voluble ethnic group clamoring to be heard for as long as it was commercially viable. 11 11 Teachers using this listicle as a branching off point for teaching resources may also enjoy Sunny Yudkoff’s pedagogy post for In geveb on teaching Yiddish radio in her intermediate Yiddish language courses. Listen to an explanation of “thilim beys-medresh” from the LCAAJ. Weinreich, the chief architect of the postwar field of Yiddish, could never have imagined that his language and culture atlas would someday be accessed primarily in audio form, word-for-word, phrase-by-phrase, rather than in densely printed volumes full of isoglosses. Hardnosed secularist though he was, he probably did intuit that the destruction of the European hinterland had turned Yiddish orality into a veritable Torah shebe’al peh, an oral Torah, a cosanctified and indispensable repository of the usable European Jewish past. 12 12 Learn more about the Language and Culture Atlas of Ashkenazi Jewry here, in our interview with Michelle Chesner, Norman E. Alexander Librarian for Jewish Studies at Columbia University, who is working on digitizing this material. The Internet has completely upended the content and contexts of Yiddish orality. In retrospect, Yiddish radio was just a dry run, now that the Internet has globalized the reach and radically eclecticized the programming of radio. No longer local, no longer limited to specific times and days of the week, no longer commodified into binary opposites—popular vs. highbrow, religious vs. secular—the Internet traverses time and space, here-and-there, past-and-present. Kol Haloshon began and continues as a hotline (781-906-6400) established in 1995 that offers shiurim (talks) recorded at events or given specifically for the hotline. The talks are now available via Kol Haloshon’s website. Yosef Nachum Shtrum is one of hundreds of scholars who offer sikhes, inspirational small-talk, or shiurim, formal instruction in Jewish sacred texts, geared to men, women or children. Obviously, therefore, this kosher website is designed for internal consumption. Even as it offers a menu of linguistic choices, including English, Yiddish, Hebrew, French, Russian, and Bukharin, Kol Haloshon helps maintain Yiddish as a unifying language of the worldwide Hasidic community and insulates them from the rest of world. Shtrum himself appears on the computer screen in standard Haredi garb, and could be anywhere from 20 to 35 years of age. In this brief segment from one of his sikhes, Shtrum speaks the transnational Polish Yiddish favored by Hasidim the world over. Free of English, modern Hebrew or other foreign loan words, his speech is therefore universally accessible—and timeless, as befits a speech genre venerated among Hasidim. Embedded within this particular inspirational talk is an even more venerable speech genre, a mushl, or parable, about two merchants, who in time of famine, tried to make a sale. One arrived in town with an all-or-nothing offer of ten wagons for 10,000 zehuvim, gulden: six that were of straw and only four of wheat. He clinched the sale in no time. Another merchant, trying to copy his success, brought to market ten wagons of straw for the same asking price and came up empty. The moral: He who combines Torah study with profane matters will succeed on the strength of his Torah, whilst he who is devoid of Torah will get nothing in return. 13 13 Thank you to Rose Waldman for verifying this information. The Internet is also home to a new generation of secondary Yiddish speakers, which is to say, non-native speakers who have come to Yiddish for various and sundry reasons. Vaybertaytsh is a second-generation Yiddish website that went live in 2016 in Tel Aviv. Its creator, Sosye (Sandra) Fox, opens her inaugural podcast with the edgy sound of the Yiddish comedians Djigan and Shumacher. 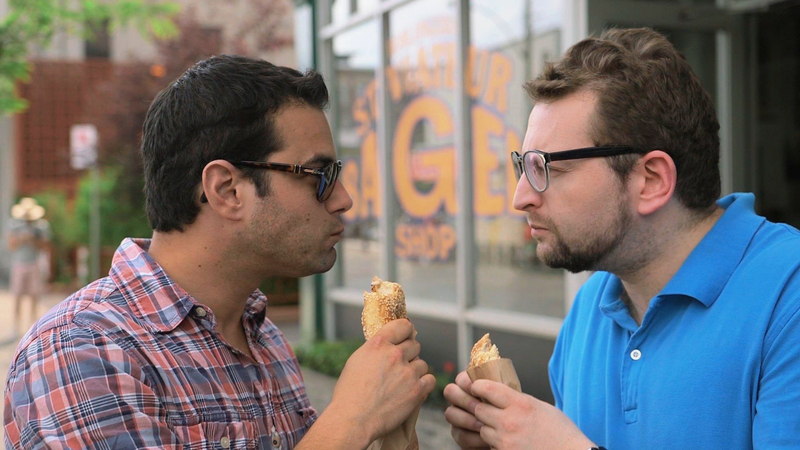 Her choice of comic routine—Djigan and Shumacher impersonating a husband and wife four years into their marriage—allows her to both foreground the sexual politics of prewar Yiddish humor and to spoof it. “A salat hot zi gemakht. A salat! A salad is what she made for lunch. Can you imagine? A salad!” screams the exasperated husband. A man in the kitchen is not even a remote possibility. Starting with its very name, everything about this website is aspirational. “Vaybertaytsh,” which literally means Women’s Yiddish, is the name of the typeface used for books published in old Yiddish. For Fox, the print culture of medieval Ashkenaz is a foil for the sound of recorded and modern spoken Yiddish, as Jewish women categorically throw off their gendered, secondary status. The result is a modern media construct never heard before. The podcast is addressed to “mayne tsuherers, listeners of both genders,” in a Yiddish that is unabashedly American and while fluent, not entirely grammatical. As Fox later explains, had she waited to achieve perfection, she would have never launched the website in the first place, while men in a similar situation do not suffer from such qualms. So even before Fox offers her personal tribute to the female vocalists who raised her feminist consciousness back in 2005, it is the hybrid nature of her speech that convinces us of her sincerity and authenticity. Listen to Vaybertaytsh’s introductory episode. Sholem Aleichem could hardly have imagined how the time he spent in the RCA recording studio would immeasurably advance the sound and scope of Yiddish orality. For him, it was the end of the line, but for the future course of Yiddish orality, it was only the beginning. As lists go, this one is heavily slanted. It places the mechanical reproduction of Yiddish solely within an American industrial context. Why acquiesce to such a neocolonial and neo-capitalist approach? The answer is: as time goes on, we realize how much of what we now value in Yiddish culture was either made in the USA or was exported therefrom. (See, on this, my review of Avraham Novershtern’s recent work on American Yiddish literature). Another untold story that arises from this list is the importance of North America both as refuge and incubator of postwar Yiddish cultural production. Everyone included in this list, from Sholem Aleichem, Noah Nachbush and Hertz Grosbard to Uriel Weinreich and Ruth Rubin found a home in America. Yet, for all that, there is something very arbitrary going on here, and an additional reason for posting this list is to ask the question: what archives of Yiddish orality might still come to light as digitization projects continue and if open access via the internet continues to expand? What new projects might already be underway by Yiddishists in Israel, France, Poland, Russia, Argentina, Mexico and elsewhere? Edward Hirsch, “Fully Loaded: The Poetry of Celia Dropkin,” JQR Review 93 (Spring 2017). http://www.vqronline.org/essays-articles/2014/04/fully-loaded-poetry-celia-dropkin. For English translations of “Durkh nakht un regn” see, Sing, Stranger: A Century of American Yiddish Poetry, ed. Benjamin Harshav, trans. Benjamin Harshav and Barbara Harshav (Stanford: Stanford University Press, 2006), 676. Available online: https://books.google.pl/books?id=NFpBOIjFWEgC&lpg=... The recording is included on the cd "The Golden Peacock: The Voice of the Yiddish Writer". Itay Zutra, In zikh (1930-1940): Yiddish Modernism in Search of Jewish Self-Consciousness (Doctoral dissertation). Jewish Theological Seminary, New York, 93. To our knowledge, this poem has not been translated into English. Listeners are advised that the poem includes the n-word. Beatrice Lang Caplan, "Tsvi skuler der grammayster" YIVO-Bleter: Naye Serye, Band IV. Yidishe Folklor/ Yivo Bleter: New Series, Volume IV. Yiddish Folklore. (2003): 193-234. Teachers using this listicle as a branching off point for teaching resources may also enjoy Sunny Yudkoff’s pedagogy post for In geveb on teaching Yiddish radio in her intermediate Yiddish language courses. Learn more about the Language and Culture Atlas of Ashkenazi Jewry here, in our interview with Michelle Chesner, Norman E. Alexander Librarian for Jewish Studies at Columbia University, who is working on digitizing this material. Thank you to Rose Waldman for verifying this information. Roskies, David G. “Playlisticle: Yiddish Orality in an Age of Digital Reproduction.” In geveb, June 2018: https://ingeveb.org/blog/playlisticle-yiddish-orality. 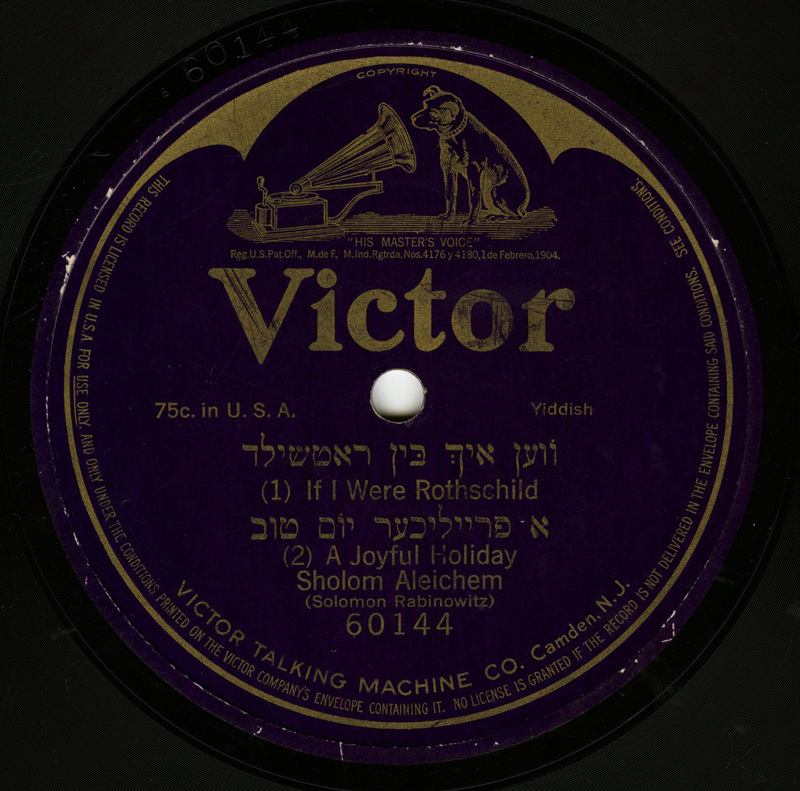 Roskies, David G. “Playlisticle: Yiddish Orality in an Age of Digital Reproduction.” In geveb (June 2018): Accessed Apr 22, 2019.